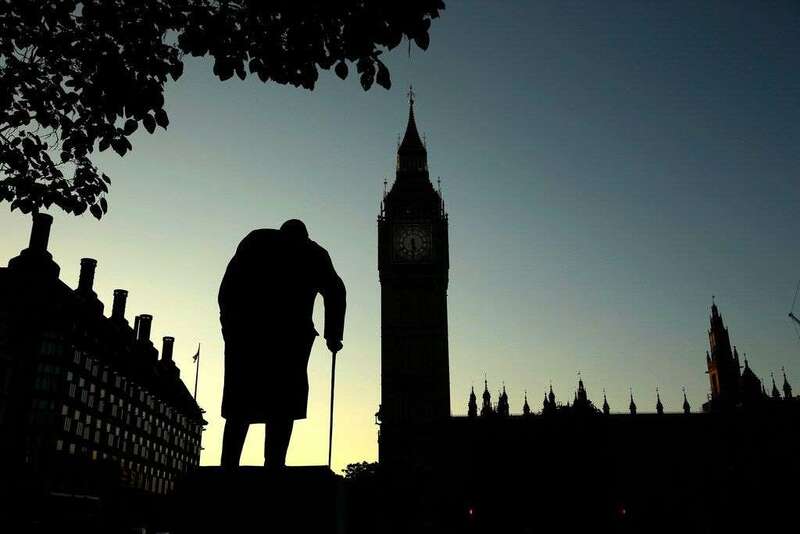 A statue of Winston Churchill is silhouetted against the Houses of Parliament and the early morning sky in London on June 24, 2016. British Prime Minister Theresa May will try to win the support of her divided Cabinet on Wednesday for a draft deal to leave the European Union after months of stalled talks, bickering and setbacks that have threatened the messy divorce known as Brexit and May's leadership. Britain is due to leave the bloc in March. On Tuesday, it broke a four-month-long logjam with EU negotiators over the terms of its withdrawal, including a plan to keep the border between the Republic of Ireland and Northern Ireland open after Brexit. But pro-Brexit lawmakers in May’s divided Conservative Party are angry, saying the agreement will leave Britain tethered to the EU after it departs the bloc. Failure to secure Cabinet backing will leave May’s leadership in doubt and Brexit in chaos. "Theresa May’s Brexit agreement is the worst deal in history," Nigel Farage, the British politician and broadcaster who helped engineer the June 2016 Brexit vote, tweeted. Farage represents Britain in the European Parliament in Brussels. May herself told lawmakers on Tuesday that the draft deal "takes us significantly closer to delivering what the British people voted for" when they decided to leave the bloc. She said the deal means that Britain will "take back control" of its laws and borders "while protecting jobs, security and the integrity of our United Kingdom." Still, Britain's former Foreign Secretary William Hague said a failure to back the draft deal could lead to a new Brexit referendum and even a general election. "It would probably mean a different government," Hague said in a BBC radio interview. He add that another Brexit referendum "might not resolve matters" that if it did happen it would be "the most divisive and bitter political conflict in this country in 100 years, and very economically damaging." Britain voted to leave the EU by 52% to 48% in the vote. Some polling data indicate that if there were a second Brexit vote a majority would chose to stay in the EU. May has repeatedly rejected the idea of holding a second vote. May is meeting with her Cabinet on Wednesday afternoon to talk about the deal. She is expected to give a statement to Parliament on Thursday. Other aspects of the deal, which has not been made public, include Britain's trade relationship with the EU and what rights the 3.8 million EU nationals who live in Britain will retain after the divorce.